My daughter will be moving up from kindergarten in a few weeks. When she was getting ready to enter kindergarten last year she was given an assessment of her skills to see where she falls in comparison to her classmates. While every child learns and develops at a different pace so the same things cannot be expected from every child schools like to see where children stand with certain skills. Below are some of the skills that my daughter was evaluated on and some of the skills that our district recommends children entering kindergarten have at least started to learn. 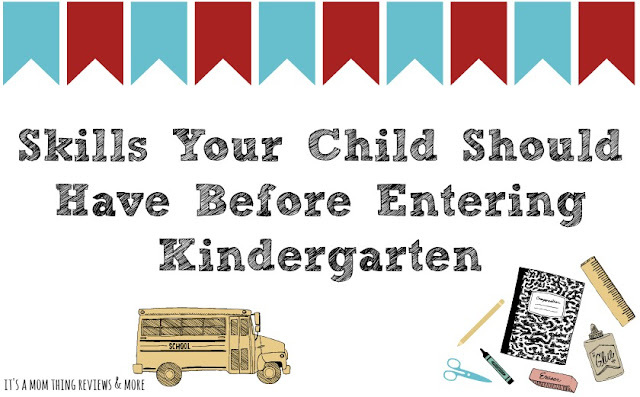 I hope that this list helps in preparing your children for kindergarten! Understands and uses measurements such as big and little, short/long and less/more. Able to recognize positions and directions such as up and down, in and out, above and below. There are many resources that can help to prepare your children for kindergarten such as educational apps, learning websites, and workbooks. There are also many learning games that you can find to help children with some of these skills. Incorporating skills into fun activities is also an awesome way to help children to learn some of these concepts! I so totally agree with all the skills you have listed. It's why I like having kids go to pre-k before actually heading into kindergarten. It sure does help a bit. This is really a great comprehensive list for parents. Especially parents with their first child getting ready to attend kindergarten. My kids are through college now but I think they had most of these skills. They did go to pre-school part time before Kinder so that helped also. Thanks for putting this list together. I still have one more kiddo who need to go off to school in a couple years. This is a very helpful list! I am sure it is going to come in handy for those parents that have children starting school soon!